Established in 1994, Paul Trading Corp. is a young company possessing strong potential and characteristics. Centering on the company’s representative and president, Junhee Nam, all its staffs are each placed in charge of different items and roles. Everyone at Paul Trading maintains an industrial mindset of “give priority to the customers” as the core of the enterprise. Therefore, a large majority of new customers continue with their deals, building relationships of warm confidence. The company has operated its own auto junk yard named “Godbyecar” (8,000m2) and so supplies new & used & rebuilt Hyundai, Kia, Ssangyoung and Daewoo engines D4BB, D4BH, OM662 etc., and used parts in good working condition. This premium engine oil is made 100% from PAO with cutting edge technology. Kixx PAO 1 is a premium performance, multi-grade motor oil formulated from selected synthetic base fluids and raceproven additive technology. It can be used in passenger car engines and light truck gasoline engines and passenger car diesel engines under all operating conditions. It is optimized to provide complete engine protection plus ultimate performance. GS Kixx Lubricants are derived from flexible production of Group II and Group III base oils and provide premium quality for various needs of lubricants. As parts of the effort to provide premium quality products, Kixx Lubricants built many state-of-the-art lubricants blending plants as well as introduced quality control systems such as ISO9001/14001, QS 9000 and ISO/TS 16949. GS lubricants are provided to the Korean government and various global companies including Volvo Equipment, Samsung Electronics, Hyundai & KIA Motors, LG Chemicals, POSCO, Hyundai Heavy industries, Doosan Infracore as OEMs. Kixx Lubricants are certified by MB (Daimler Chrysler),BMW, Siemens, Alstom, etc. D&S has since its establishment in 2010 been supplying top-quality auto parts that are previously applied to Koran auto makers – Hyundai and Kia, SSangYong, and GM Daewoo – to overseas markets to be used at repairing cars. D&S is handling only the product that the buyers can trust. It will make further utmost efforts to move more closely to the hearts of customers. D&S proudly ensures competitive prices, fast delivery, safety packing, technical support, follow-up customer order, and full assistance. The current hottest items include bushing, hose, lower arm, stabilizer link, rack end, oil seal, bearing, filter, sensor, shock absorber, brake pad, ball joint, tie rod end, and engine mounting. D&S supplies an OEM parts, genuine parts, and OEM parts &non-genuine parts. D&S used to sell new product only before, but now it adds secondhand or recycled parts to product sale in order to secure various customer levels. For secondhand or recycled items, the company is preferentially selling engine & transmission assy, alternators, starters, steering gear, various lamps, calipers, compressors, constant velocity joints, turbo chargers, injectors, high pressure pumps, side mirrors, front bumpers, and rear bumpers, and plan to add further items in future. Also, D&S is now in discussion with relevant companies about the export of used cars. D&S promotes itself by participating in automobile component exhibitions once or twice per year including the 2015 Teheran Exhibition and the 2016 Moscow Exhibition. For this year, it has no specific plans thus far, but plan to participate in automobile components exhibitions in India, Moscow, Dubai, and Shanghai in 2019. It may also participate in Malaysian and Laotian market pioneer teams that will be held in the second half of this year. D&S puts top priority for its customer’s needs and benefits. [INQ. NO. 1501M19] Halla Industry specializes in auto parts ranging from steel press-forming, processing, injection molding and assembly of finished products. Halla Industry was founded in 1978 with accumulated know-how and expertise in the field more than 35 years before. Based on those experiences, it has positioned itself as a specialty maker of automotive parts. Started with supplying its advanced products to two domestic conglomerates – Hyundai Motor, LG Chem in 1978 and 1979, each, as one of the primary cooperative companies in Korea, Halla Industry has been continuously knocking potential overseas markets, increasing its brand awareness worldwide. Halla Industry also signed a contract with the Air Force Logistics Command regarding the localization of the components. The company was also certified as one of the nation’s promising small-and medium-sized export companies by the Korean government. Halla Industry established the affiliated R&D center, and through innovative technological developments, the company was designated as the innovative venture company, and also the “INNO-BIZ” company by the Korean government. Moreover, the company was selected as the clean workspace company, and also certified as the company that specializes in parts and materials. To increase the technological capability in collaboration with the academic field, Halla Industry also signed an agreement with Pusan National University in 2010 and Gyeongsang National University in 2010 for the industry-academic cooperation. Now various models of highly competitive automotive components including bumper parts, clip parts are steadily winning good reputation from overseas customers. The bumper parts developed and manufactured by Halla Industry cushion the damages that might be caused to trunks, vehicle doors by being attached to the places where any impact might take place. 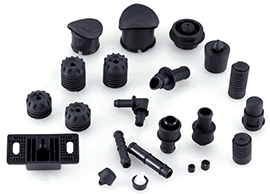 Materials are plastic, which are injection and rubber products. Products are highly endurable, and also efficient. Halla Industry’s clip parts were manufactured with an aim to help protect the cables and wires used inside a car and also fix them to the vehicle frame. Materials used for the product are SUS, AL and rubber. The clip parts are pressed, spot-welded, processed and assembled products, which enable to fasten specific parts of the vehicle. Halla Industry acquired numerous certifications, including the KSA 9001, ISO 9002, QS 9000, KSA 9001, ISO 9001, TS16949, and many others. Also, patents and utility models had been registered and acquired. Standards related to KS, JIS, ASTM, SAE and cooperative companies are managed to be in accordance to the each specific drawings and standards. [INQ. NO. 1501M18] Jinheung Brake was established in 1968, and has for 45years specialized in the development and manufacture of brake pads, brake shoes and linings for domestic and foreign vehicles. Through product quality and delivery service, Jinheung Brake had been recognized by customers for its on-time delivery. Recently, the company has been exporting all kinds of auto-parts for Korean vehicles including engines, tires and batteries as the new business sector. Through 47 years of accumulated know-how and experience, the priority of Jinheung Brake is to manufacture and supply the finest brake pads and brake shoes to customers domestically and internationally, and the ultimate goal for the company is to become the leading vendor among global manufacturers in the automobile industry. 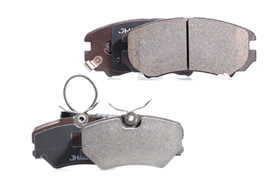 The Megatron Brake Pad, developed and manufactured by Jinheung Brake especially for the Peugeot 405 model, provides quick and smooth braking, with low noise and dust. The products are manufactured domestically through Jinheung Brake technology, which is high quality and backed by the ISO / TS 16949 certification. The Megatron Brake Pad provides longer life and excellent reliability, and features quick response, smooth operation, quiet operating condition, complete quality control, sharp delivery and long life. For safer driving, Jinheung Brake enhanced the performance of the materials considering reliability. Also, through the new technology of materials, the Megatron Brake Pad enables quiet conditions when driving, and based on QS 9001, ISO / TS 16949 System, every procedure of the manufacturing is assured by strict inspection. 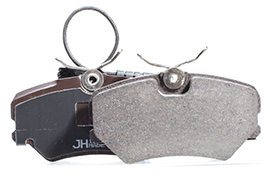 Jinheung Brake focuses on the innovative development of brake pads and shoes, combined with its 47 years of expertise. Through continuous development of technologies, Jinheung Brake is realizing the manufacture of top-quality and safe products for customers, and also enabling price competitiveness. These main features have ensured customers’ longterm business relationships with the company. Products developed and manufactured by Jinheung Brake are not only distributed domestically, but also to many foreign automobile manufacturers worldwide. Since its establishment in 1968, Jinheung Brake continued its efforts to develop new technologies for better quality and efficiency, and as a result, acquired several certifications, including the ISO / TS 16949 Certification, ISO 9001 Certification, and the QS 9000 Certification. Also, Jinheung Brake is equipped with all kinds of machineries to enable the complete self production processes of the brake pads, brake shoes and brake linings. Through the complete selfproduction process, the company offers excellent price competitiveness and quality control. Filed Under: Automotives Tagged With: auto parts, brake linings, Brake pad, brake shoes, Jinheung Brake, Jinheung Brake Co. Ltd.
[INQ. NO. 1410M06] Jinheung Brake was established in 1968, and has for 45years specialized in the development and manufacture of brake pads, brake shoes and linings for domestic and foreign vehicles. Through product quality and delivery service, Jinheung Brake had been recognized by customers for its on-time delivery without claim. Recently, the company has been exporting all kinds of auto-parts for Korean vehicles including engines, tires and batteries as the new business sector. Through 45 years of accumulated know-how and experience, the priority of Jinheung Brake is to manufacture and supply the finest brake pads and brake shoes to customers domestically and internationally, and the ultimate goal for the company is to become the leading vendor among world manufacturers in the automobile industry. The Megatron Brake Pad, developed and manufactured by Jinheung Brake especially for the Peugeot 405 model, provides quick and smooth braking, with low noise and dusts. 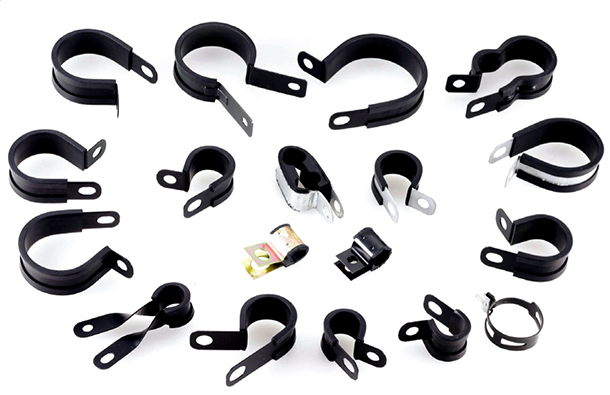 The products are manufactured domestically through Jinheung Brake technology, which is high quality and certified of the ISO / TS 16949 certification. The Megatron Brake Pad provides longer life and excellent reliability, and features quick response, smooth operation, quiet condition, complete quality control, sharp delivery and long life. Jinheung Brake focuses on the innovative development of brake pads and shoes, combined with its 45years of know-how and expertise. Through continuous development of technologies, Jinheung Brake is realizing the manufacture of top-quality and safe products for the customers, and also enabling price competitiveness. These main features have enabled the customers to have a long-term business relationship with the company. Products developed and manufactured by Jinheung Brake are not only distributed domestically, but also to many foreign automobile manufacturers worldwide. Since its establishment in 1968, Jinheung Brake continued the efforts to develop new technologies for better quality and efficiency, and as a result, acquired several certifications, including the ISO / TS 16949 Certification, ISO 9001 Certification, and the QS 9000 Certification. Also, Jinheung Brake is equipped with all kinds of machineries to enable the complete selfproduction processes of the brake pads, brake shoes and brake linings. Through the complete self-product process, the company enables price competitiveness and also quality control. Filed Under: Machinery Tagged With: auto parts, brake linings, Brake pad, brake shoes, Jinheung Brake, Jinheung Brake Co. Ltd. The Seoul Motor Show is a biennial motor show where domestic and foreign auto makers showcase their latest models that are either in production or at the R&D stage as well as new technologies for future models. The Seoul Motor Show dates back to 1995 and it is Korea’s only international motor show that has won the OICA( Organisation Internationale des Constructeurs d’Automobiles) accreditation. The 2013 show will be the 9th event of the Seoul Motor Show. The Show, which was designated by the Ministry of Knowledge Economy as one of the top global exhibitions, has evolved into a major and well renowned exhibition held in Korea. Furthermore, it seems to be on the right track for joining the ranks of other top motor shows such as the Frankfurt Motor Show, the Paris Motor Show, the North American International Auto Show and the Tokyo Motor Show. The Seoul Motor Show 2013 is scheduled to be held for 11 days from March 28 to April 7 at KINTEX (Korea International Exhibition Center), Goyang, Gyeonggi Province. Under the theme of “With nature, for the people”, passenger cars, commercial vehicles, two-wheeled vehicles, bicycles, auto parts and other related devices will be on display at the exhibition. The 9th Seoul Motor Show will offer visitors a rare opportunity to have a panoramic view of the ongoing trend of the global auto market and new auto technologies. The 9th Seoul Motor Show will be the biggest motor show ever held in Korea, featuring 150 companies (including auto makers and parts suppliers) from a total of eight countries with an expected 1.2 million visitors. The Seoul Motor Show 2013 will be an improvement on previous events With the opening of the second phase of KINTEX, the Seoul Motor Show 2013 will be the biggest ever held in Korea with 102,431sqm(1,102,558sqft), solving the previous problem of insufficient space for the Seoul Motor Show. In sync with an increasing focus on low-carbon and green growth around the world, an array of eco-friendly, highefficiency, energy-saving small cars, hybrid vehicles, fuel cell vehicles (FCVs) and electric vehicles (EVs) will be displayed to stimulate public interest in the ‘green vehicle’ trend. A variety of peripheral programs are also in the wings to entertain visitors: by lottery, a car and a bicycle will be randomly awarded to visitors each day. To better serve the forecasted 1.2 million visitors at the Seoul Motor Show 2013, there are a slew of programs in the pipeline such as a Telematics International Seminar, the Best Car made by College Students program, an Automotive Design Competition for College Students, the Most Popular Car Award, UCC Contests and Test-driving for Eco friendly Cars. What’s more, a total of 10 cars will be given to visitors for free by lottery during the 10-day Motor Show. On top of that, a bicycle will also be handed out each day to a lottery winner to make the Seoul Motor Show 2013 juicier and more visitor friendly. In addition, to make sure visitors’ have a pleasant tour of the show, amenities and resting places will be expanded. 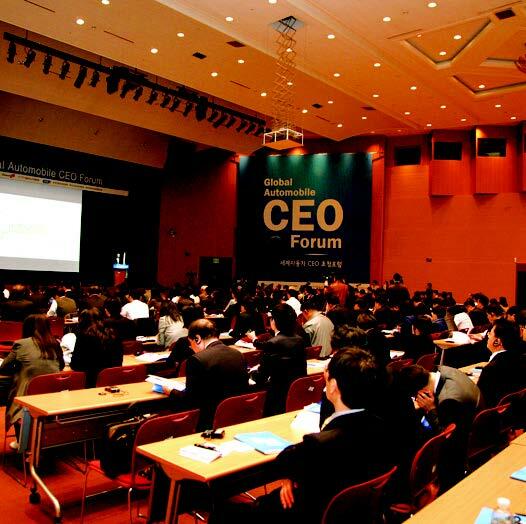 If you want more information about ‘the Seoul Motor Show 2013’, please contact us.